If you had visited the Collars workshops during the latter half of January it would have been as though you had stepped back to the 70's and early 80's when our oar production was in it's prime. This time however the oars were not being made for countries to defend titles at international competition, but simply for show. Two months previously we were approached by the Anouska Hempel Design Agency based in London to produce a wooden rowing oar of a particular shape and design. Most noted for their influential interior hotel designs, along with exclusive retail boutiques, Lady Weinberg, owner of a traditional 85ft Turkish Gulet was no stranger to rowing oars and knew exactly what she was after. With the excellent River and Rowing Museum in Henley providing a good source of reference we managed to find a pattern in our archives that closely matched the intended design, and a sample oar was produced and delivered just before the Christmas break. Intrigued to find out more, it was soon established that the oars were destined for a designer clothes boutique in Milan, Italy. The Henry Cotton's flagship store had commissioned the Anouska Hempel Agency to carry out all interior design work, and with their brand's sporting connections, rowing was a perfect choice. 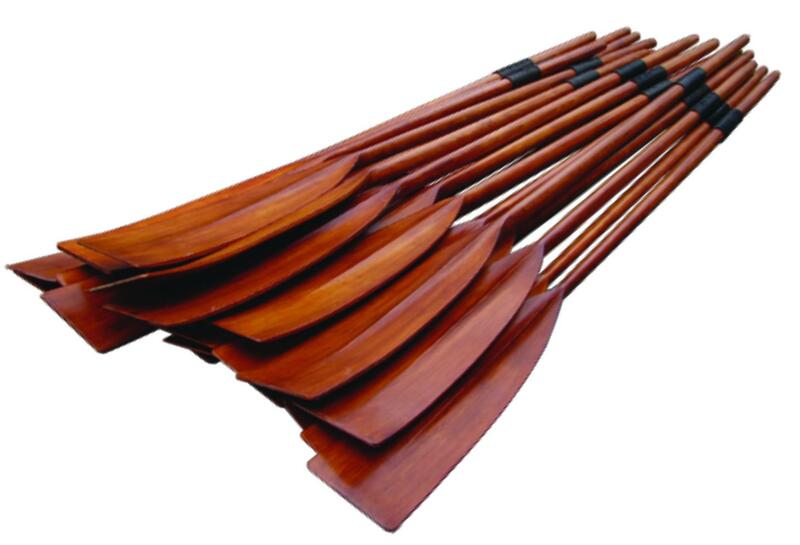 It was specified however that the oars were to have a period look, stitched on leathers and French polished with a wax sheen finish. With a total order for 56 oars no time was wasted in getting to work in setting up for oar production, as the 3 week delivery deadline was half what it should realistically take. Using everyone's skills most efficiently we turned upside down the normal way a shaper would produce an oar. Instead the front of the blade was done by one person, handed to the next in line to do the back, then on to another to do the loom, someone else to shape the handle, before finally onto a team of sanders. It worked, and the oars flew into the varnishing shop where getting the right colour and finish proved to be the next challenge. A sample oar was sent on to a specialist French polisher before ending up in Italy for final approval. This was speedily returned to us as a control sample, and we set to work with samples of timber to find a quick solution without going down the route of proper French polishing. After a few hours with countless stains and mixtures of different products we struck upon the perfect colour match using a simple Rosewood stain ragged onto the timber. This was then overcoated with 4 coats of Garnet Shellac followed by wire wool with an antique wax, and a final polish with clear beeswax. The result was stunning, and not only identical to the sample, using Shellac but we could completely finish the oar in a matter of hours rather than days. The modern cutting edge design of the Milan store includes a glass atrium over three floors housing the elevator. As a result we were asked to produce four oars that were to be positioned around the edge, from floor to ceiling, a total height of 34ft (10 meters). Scaled up to carry a 6ft (2 meter) blade the oars were by far the largest we had ever been asked to produce and certainly looked impressive. Although none of the oars will ever be used in water, each one, individually made by hand, will still bear our name and hopefully be admired by people throughout the world for many years to come and stand as a testament to our craft.